Strengths – Although it can sometimes be hard even for Scorpios to accept this fact, their greatest strength is their sensitivity. While many Scorpios hide from their own emotions, not knowing what to do with their intensity and depth, when they find a way to regenerate and forgive those that hurt them, they become amazing healers, psychologists, partners and friends. Weaknesses – Once they do get hurt, this pain goes too deep and they have the urge to turn to vengeance, often becoming filled with hate and anger. These emotions can get destructive, to others and themselves, and their true challenge is to accept them as normal and usual, in order to set free and turn to the future instead of staying buried in the past. As partners - Scorpios are loyal and dedicated in all of their relationships, and once they feel like they have “clicked” with another human being, they will become open, protective, and incredibly close. As intense people, they rarely settle for less than what they feel is right, and they will take betrayal worse than any other sign of the zodiac. In romantic relationships, this can cross some boundaries of their loved one, and they should be careful when building relationships with free-spirited individuals that might feel tied by their approach. They have to steer clear of symbiotic bonds and give enough room for their partner to build their own world in every area of life, have enough time alone, and breathe. If a Scorpio jumps into their obsessive mood, they fail to see that this pushes their loved one away, creating too much pressure and taking away the magic out of love they fight for with such intensity. In the end, this can lead to hurt and suffering, but the only thing causing it turns out to be their desire. As parents - these individuals get flooded by feelings and swept away by the power of blood bonds. The greatest challenge they have to face in parenthood is fear of being let down or left alone. They have to give room and leave decision-making to their children from the start, while accepting the fact that they were made to fly away from the family nest, and at the same time not feel hurt by this fact. In time, this inner conflict gets stronger, and even though they might even lack attachment in relation to the baby, with time, they can tie themselves into a knot with a grown child. 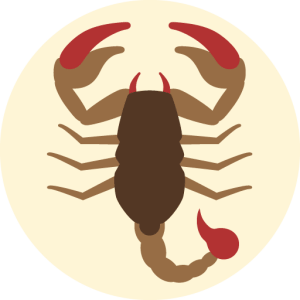 As children - a Scorpio is often quiet and reserved, even though they can go to other extremes and become aggressive if their family circumstances are not tender and caring enough. As soon as they learn how to express their first emotions, these individuals will be intense and often misunderstood by their parents and other children. They need an emotionally stable parent, usually mother, in order to learn how to name and show how they feel. In general, little Scorpios are not high maintenance and they will be easily satisfied when it comes to basic physical needs. They will, however, present an emotional challenge, and sometimes rush into danger without a clear image of possible consequences. The most passionate of all signs, Scorpio is the pool of deepest emotion, sexuality and primal instincts. It is not easy to carry around that sort of energy, control it, and be calm about their feelings as some other signs might be. When they fall in love, they easily get possessive, but not because they are insecure as it is often misread, but because they want to unite and become one with the person they chose. Sensual and passionate, a Scorpio is a great lover, interested in human sexuality from the moment they were born. As a fixed sign, Scorpio takes romantic relationships seriously, and don’t enjoy short-term bonds that have no seeable future. Scorpio is resourceful, determined, focused, professional, and often excels in their path if they follow their talents and true motivation. If they choose a job that doesn’t support their creative side, they can get depressed and even ill, and their best bet is to follow their inner personality wherever it takes them, even in directions that aren’t approved by those that surround them. Whatever their career choice, a Scorpio should always stay out of debt or shady activities, for karma doesn’t wait long to kick in and the feeling of guilt is well hidden and buried under a rug. They need a clean slate, work that motivates them, excites them and makes them feel curious, confident and proud. Focused as a sign ruled by Mars and Pluto, Scorpio is the point of greatest energy and focus. When they want something done, they can get obsessive and incredibly dedicated to their goal. Intuitive with a deep understanding of the way the Universe works. This makes them good in any job that needs digging, research and someone who is always one step ahead or prepared for the worst. Deep for without a doubt, this is the sign that rules deepest emotions, mind processes and physical challenges. If you want to discover what hides behind any act or situation, Scorpio is the person to talk to. Manipulative and strangely unaware of this trait, Scorpios often use their depth of understanding to lead people into a desired direction. Passive and feminine, this is a sign that carries complicated emotions within, and every Scorpio has to be careful and stay direct and respectful towards other people at all times. Jealous out of fear of getting hurt, and we need to keep in mind that they rule deepest of emotions. This makes them one of the “softest” signs of the zodiac and easily frightened of betrayal. Resentful for all the complicated reasons only they understand. Once they create distance from someone, they will not inform the person in question of their choice, why they made it, and often fail to communicate and resolve a thing that could easily be a simple misunderstanding.